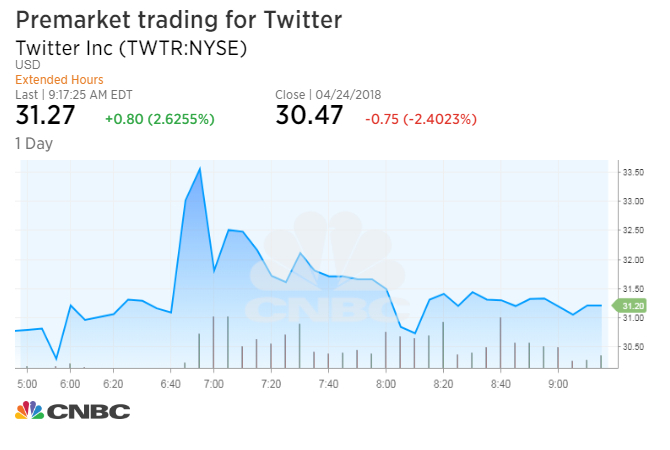 Twitter fell more than 5 percent Wednesday morning after an earnings beat that initially sent shares as high as 13 percent in premarket trading. The social media company beat on both the top and bottom lines in the first quarter, and shares opened 2.9 percent up at $31.35 after trading as high as $34 in extended hours. The stock gave up all its gains, falling below $30, after the company softened its forecast on an earnings call Wednesday morning. The World Cup, which will be held June 14 to July 15 in Russia, will be a large advertising event in the first half of the year for Twitter, CEO Jack Dorsey said in a call with analysts. However the company will face tougher competition in the second half the year, as it is still working through the “business recovery” it began in the third quarter of 2017, Dorsey said. The company still expects to be profitable for 2018. He advised that revenue may mimic 2016, but urged analysts to base their revenue models on Twitter’s sequential revenue growth. The stock is up more than 30 percent on the year and more than 110 percent in the 12-month period.